GreenSocks - Lawn Mowing Services Carseldine - So Easy! Are you tired of mowing your lawn? Well the good news is, we are here to help. We’ll give you an instant online quote. To book a lawn mowing job with us, it’s a simple process of completing the online booking form which provides you with an instant online quote and then we’ll send you the best local lawn care provider available. The process is so simple and hassle-free that you’ll wonder where we’ve been all your life! GreenSocks prides itself on making the whole process an enjoyable experience. Eden Gardens attracts thousands of visitors from near and far, and it’s easy to see why. If you’re a garden lover, you could spend a couple of hours at Eden Gardens – marvelling at their garden displays, exploring their selection of hard-to-get-elsewhere plants, enjoying the Dragon Fly cafe, learning at their on-site educational workshops, talking to their super friendly and knowledgeable staff, watching the children enjoy the fun playground for kids, and even just wandering around their relaxing water features and green environment. It’s almost like visiting a builder’s display home – but for the garden. Their displays get your creative juices flowing – which helps a lot if you’re new to the whole world of plants, lawns and gardens. They also cater to all budgets – which might explain why every visitor we saw was carrying at least one thing from Eden Gardens back to their car! Not sure what to buy for your garden or lawn? Never fear. 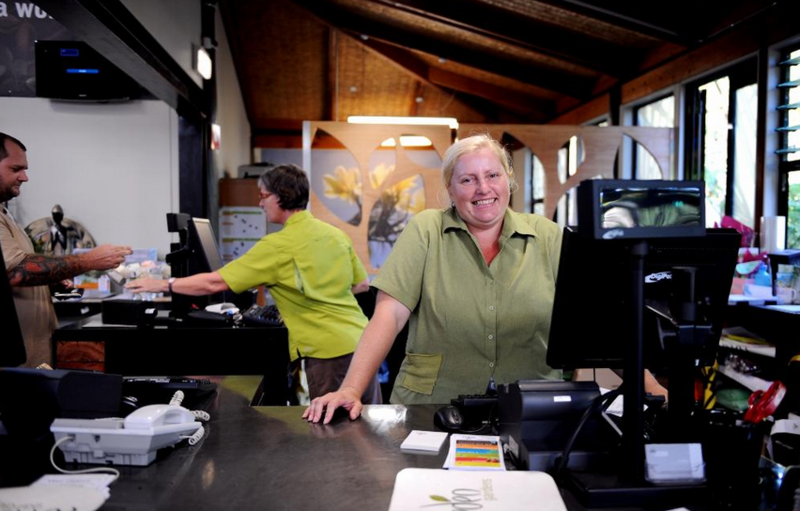 The team at Eden Gardens are incredibly knowledgeable and will give you all the advice and tips you need – with friendly smiles to boot. The staff as just so friendly at Eden Gardens Carseldine. Image credit: Eden Gardens. 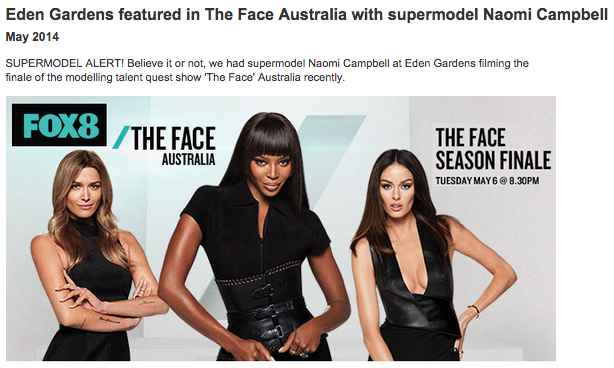 Supermodel Naomi Campbell filmed at Eden Gardens in North Ryde, Sydney. Will she come to Eden Gardens, Carseldine next time? Update: Want to see lots of photos from our visit to Eden Gardens? From the beautiful welcome area, to the colourful flowers, exotic plants, home and garden ideas, knick knacks for purchase, garden displays and lovely Eden Gardens cafe, we enjoyed a lovely visit to this Brisbane garden centre and we highly recommend it. With more than a dozen Bunnings stores across Brisbane, most people in Brisbane are in reach of their own local local Bunnings store. But the beauty of Carseldine Bunnings is that it’s located right in the heart of Carseldine – easy to get to and easy to get back to when you’ve bought the wrong size, shape or colour of whatever you’re using to renovate or brighten up your home. If you’re still doing your own lawn mowing and don’t yet outsource your lawn mowing services in Carseldine, you can find plenty of lawn mowers to choose from at Bunnings. From petrol mowers to electric mowers, cordless mowers to hand lawn mowers, ride on lawn mowers to all of your possible lawn mower accessories, Carseldine Bunnings is the place to go. In terms of brands, they stock Masport mowers, Ryobi mowers, Ozito mowers, Victa mowers, Flymo mowers, Toro mowers, Bosch mowers, Makita mowers, Scotts mowers and more. They don’t seem to stock any John Deere mowers, Husqvarna mowers, Honda mowers, or Greenfield mowers. But if you’re only buying one mower to mow your home lawn, you probably don’t need to see every mower brand on the market, so the mowers at Bunnings should be enough for you. You can also find everything here, that you’ll need to help brighten up any grassed areas and gardens. Image Credit: Carseldine Bunnings, Brisbane. 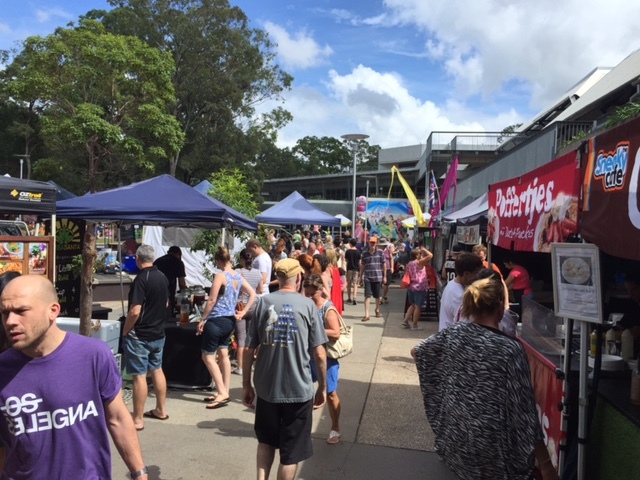 The Saturday Carseldine Farmers and Artisan Markets is not just the place to frequent for fresh, locally grown produce and gourmet food treats, it’s also a wonderful place to visit for garden trimmings and craft ideas for your home. Some of the stall holders are incredibly talented and if you’re looking for unique, non-cookie-cutter accessories for your home and garden, you’ll be glad you live close to the homegrown Carseldine Markets. Image Credit: Carseldine Farmers and Artisan Markets, Facebook page. 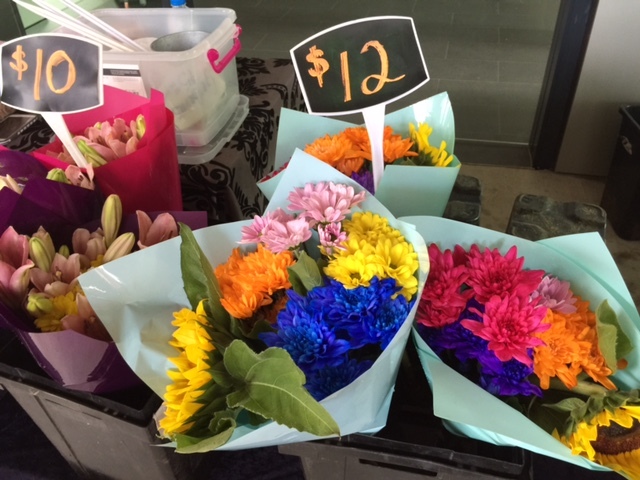 Here are some photos from our visit to the Carseldine Markets. As you can see, mid-morning there were lots of people roaming the aisles, but not too many that it ever became crowded. No one seemed in a hurry. Lots of people were standing around the food stalls, unable to make a decision because everything looked and smelt so good! We did get some good potted plants though. Lots of fresh produce and gorgeous flowers like these to brighten your Carseldine home. 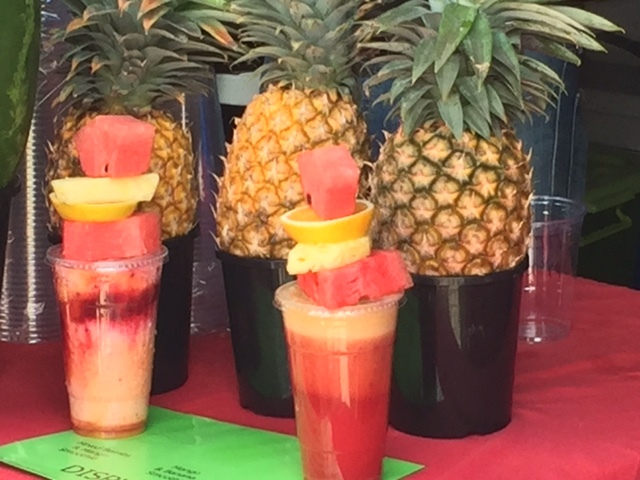 Some delicious fresh fruit options: these being the most creative and therefore the most popular. Just perfect after a hot day of lawn mowing in Carseldine! 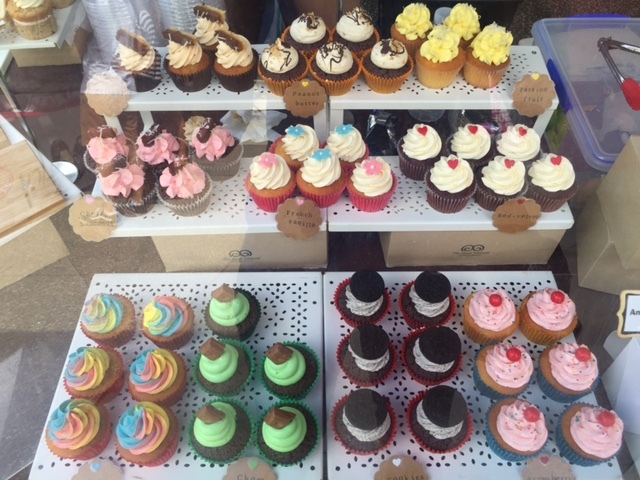 Scrumptious cupcakes were another favourite. The stall holder doesn’t sell in a bricks and mortar store yet, so you’ll need to get out of bed and come get these babies early before they sell out! 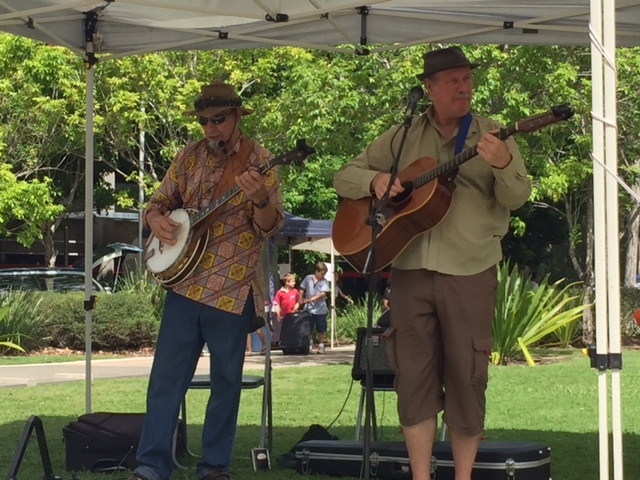 One of the best things about markets in and around Brisbane are the gifted souls who entertain us while we’re enjoying our food and drink. These guys were doing a great job. And in addition, an amazing 11 year old boy named Conor K absolutely blew us away with his ability to not only juggle sharp knives, but his encore performance of juggling two balls in one hand while solving a Rubik’s Cube puzzle in the other. Go Conor K! The Saturday Carseldine Markets are yet another reason to hire someone else to mow your lawn, so you can get out and enjoy all of the local treats on offer, right? Carseldine is a north Brisbane suburb filled with green residential lawns and 19 local parks. It sits approximately 16 kilometres north of Brisbane’s CBD and was named after the fencing contractor William Carseldine in 1858. The suburb is now home to 8,746 people. 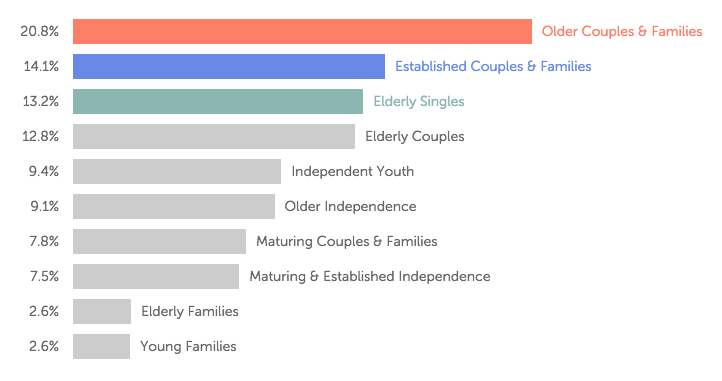 The people of Carseldine are mostly older couples and families (aged 55-64), established couples and families (aged 45-54), and elderly singles and couples (aged 65 and over). Carseldine is blessed with 19 Brisbane City Council parks – some with playgrounds, some with basketball half courts, some with electric barbecues, one with a bikeway, one with a cricket practice net, one with a netball court, and one with a dog off-leash area. Want to read about more North Brisbane suburbs? Famous Names who lived in Albany Creek? Where is the Best and Biggest Green Lawn in Boondall?